So this is all a bit of a problem. How can someone find a new job if many of the jobs are overly-demanding or look to be a recipe for over-stress? And how can companies expect to tempt people away from their jobs if the overall package isn't better? Smart people working for good companies are going to realize that the grass isn't greener somewhere else, so will be making themselves more attractive to be retained by their present employers. And smart companies with good people are going to realize that they need to make sure they up the ante to prevent people looking for greener grass. With all this in mind, I thought it would be interesting to conduct a survey to find out what companies are doing, if anything, to retain their talented DBAs, and what talented DBAs are doing, if anything, to show their companies that they're valuable employees. The original survey is here and this post is about the results. It's worth reading the "Other" answers for each survey as they paint an interesting picture – with some lucky folks in dream jobs and some being treated very badly by their employers. 5 x The company already is excellent for most of the above. 4 x I just joined the company after years at another company that did none of the above. 2 x Company is offshoring to China putting me out of a job later this year. 2 x Company is providing me oppurtunity to work in the direction of making a change in existing working & make it more beneficial & efficient. 2 x I am the company – but trying to increase my rates. 2 x Increased compensation after I told them I was going to leave. Exposing me to new SQL Server Tech that I have not had in other positions. Flexible hours, health plan, trainings. I left my previous higher paying gig to focus on what I wanted to do to build up my skillset. I left the company as a result of salary. They hired someone new and less capable for more than I asked to stay. I love this new job. Running my own SQL practice, autonomy, trust, decision making control, helping great clients. Don't tell 'em but they could withhold raises for a year or two and I'd still stay :-) First time I can ever say that about a job. Increased compensation, increased training budget, new laptop. Opposite of all: Decrease bene, no comp inc, decrease tellcom, 0 budget for training or hardware, no promo, increased expectations. Outsourcing to India and making me redundant. Retaining high quality people to work with. The companys noble vision and mission. Wait until the buy-out – salaries/bonuses may go up/be paid. I'm very surprised that half the employers out there are doing nothing to retain their staff given how hard it can be to hire new, capable people. That's pretty depressing to see. Of course, we don't know the reasons why – could be the company is strapped for cash because of the economy or just that they employ Catbert as their HR Director. And you should see some of the private emails I've had from people about how companies are truly screwing the people that work for them. On the flip-side, 40% of companies are increasing pay, flexible working, or training budgets – that's pretty cool. Savvy companies know they have to invest in their people to stay successful. For those in the first 50%, I'd seriously think about why the company doesn't seem to value it's employees and whether it's time to consider moving somewhere that does. One of the cool things about the online SQL community is that there's a lot of empathy for people looking to change jobs and twitter can be a very powerful way to get the word out that you're available. Even if it's not the right time to be able to make a move, I'd still start racking up learning experiences (either at work or on your own time) to make yourself a more attractive hire when you are able to make a move. 8 x Increasing work hours, increasing responsibility, learning on my own time, saving company money. 4 x Many of the above. More for job satisfaction than for the company. 3 x Fixing all the stuff that was bad before i joined such as no database backups (despite multiple on staff dbas). 3 x I am the company – keeping my skills relevant via out of hours training. 3 x Not what I am doing but what has happen is increasing work hours, increasing responsibility, on-cal, process efficiency and keeping it all together with bubble gum and duct tape. 2 x All of the doing, none of the nothing and actively lookin. 2 x Increasing responsibility, Learning on your own time, acting as unoffical community rep for company. Anything and everything a business owner does. Building up to become the tech face of the company. New position. Constantly developing relevant new skills. I resigned weeks ago but I'm still hanging around & helping them. I was a Systems Analyst which was part travel and working from home. Increasing work hours, increasing responsibility, learning on my own time, on-call biweekly, supporting new gloabl regions, improving proccesses, etc. Marketing, Bringing in clients, training others, setting up best practices and processes to have more help in the SQL space. Serial consulting…fixing everyone's problems then having the contract-to-hire not hire. Wow – almost 90% of people who responded are doing something to make themselves more valuable to their employers. These are smart people. If you're stagnating in your job, there's no impetus for the company to value you and so you bubble up the 'next out the door' list. However, it needs to go both ways – the company has to realize that you're increasing your worth and that over time they need to recognize that increase by giving something more to you. As the economy starts to pull itself together there's going to be a point where you should call it quits and move on if the company isn't valuing your extra efforts – there's only so long you can increase your working hours or your stress from increased responsibility until it begins to affect your home life detrimentally. When I used to manage teams at Microsoft I was very much a believer in recognizing good people and giving back to them (I was sometimes hobbled by Microsoft's nasty stack-ranking review process though) and I still do that today with the people that work for us here at SQLskills.com (Jonathan's eligible for a bonus of at least two vouchers for McDonalds Happpy Meals every month, and our assistant gets to spend the night in her own home once a week instead of sleeping in the cot under her desk – which is more than fair :-). A company cannot expect to attract and retain good people with a so-so benefits package and work environment that tolerates mediocrity and doesn't encourage people to excel. But an employee cannot expect to be valued unless they show value. It can be a delicate balancing act, with some folks doing just the minimum to get by and others pushing themselves hard to be the shining example to the rest of the team. I've always been in the latter group, but I know *lots* of people in the former group who would whine and complain when they didn't get the pay rise or bonus they expected. But this isn't about me, it's about you. IT budgets are increasing this year for sure, and you only have one life to live. Take a good hard look at where you are in your career, and how the company treats you. No one deserves to be treated badly or be unhappy in their job – and only you can do something about it. Back at Microsoft, I helped many people with their careers and my biggest message to them was that no-one is going to manage your career except you. Everyone's too busy with their own lives and careers to stop and push you to manage yours. Even as a manager, I would dedicate time to those that wanted to progress their career instead of those that didn't. To close, I want to share with you my mantra for life: "There's no fate but what we make for ourselves" (from the movie Terminator 2). It's cliched I know, but when it comes down to it, you need to make sure you're getting the deal you want – life, job, partner, house, hobbies, respect… no-one else is going to do it for you. 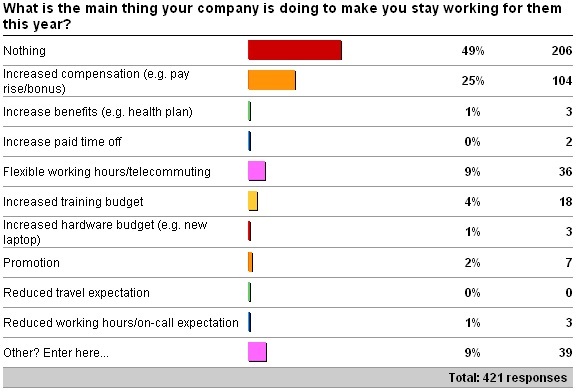 Salary survey results – are YOU being paid enough? 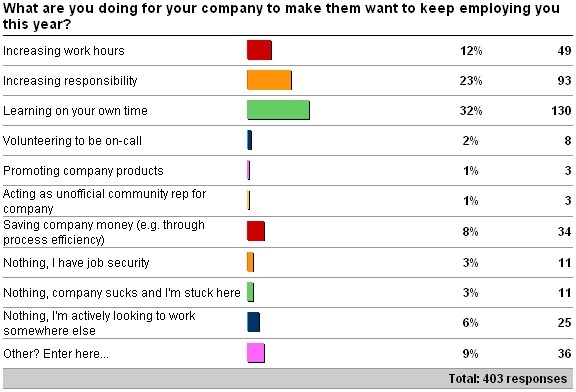 Surveys: what’s your company doing for you, and vice versa? I’ve been in IT for over 35 years. DBA for 3. I’ve heard the four data points you mention at the start almost constantly for 35 years. Most job changes I made for money were a mistake. Those I made for the Job growth opportunities or for personal reasons were mostly successful. My current employer provides a great life-work balance and that is most important to me at this point in my career. You comment "no-one is going to manager your career except you" is very true. You forgot to mention that Jonathan didn’t have to buy his own uniform (sheep outfit) although it is a hand-me-down. But I think a lot of the reasons companies aren’t trying very hard is that people aren’t moving around. Not like the late 90s. Folks are risk averse right now. In many conversations that I’ve had with employers and employees over the last year or so, I believe that there’s a pretty significant communication / realization gap between employers and their employees. This gap consists of managers, directors or VP’s fighting furiously to keep the folks that they have in the face of a challenging economy for some industries. Other industries are doing very well and I wonder if that’s partly what your survey results are showing. Is there any chance that in your survey you requested which industry or type of employer they worked for? I imagine that the 50 % of folks who believe their company is doing nothing to keep them are largely in segments of this economy that are still facing significant challenges. The majority of managers I have worked for won’t do anything to retain staff…..until you hand your notice in. Even time off to attend a conference is met with a response along the lines of "it won’t directly benefit our clients. And you won’t be billable, you’ll have to take a vacation day." When you do hand in your notice, then they want to negotiate. I know people who have bluffed and gotten a pay raise that way. But for myself, if my manager won’t engage with me when I’m a motivated employee, why should I engage with him after I’ve found a new job? Very Good Post Paul… Really Insipiring… Inspired by u these days and now by ur Mantra.. I changed companies at the beginning of this year – after 4 years with no raise and having been hired as a junior resource, proving myself and being promoted to sr resource at an apps managment/hosting company. No rewards just an insincere pat on the back when you went above and beyond. They would turn a blind eye to the employees who didnt do a shred of work. When I gave my notice, it was totally unexpected and they wanted to counter offer me whatever I asked for. I refused to negotiate – by this point I was ready to leave. I got the sense that sr management denied all requests for raises and felt that employees wouldn’t leave because there were no jobs out there. I moved on to a new sr position, more $, better benefits, less stress and I couldnt be happier. As for the old position, rumor has that nothing has changed. No raises but more and more responsibility, hours, etc. Same people not doing any work and getting away with it. I am glad so I left.